The Three Lamps corner, where Ponsonby Road, College Hill Road, St Mary’s Bay Road and Jervois Road meet, is dominated by this beautifully restored building, once the Ponsonby Post Office. Built in 1912, restored and transformed into a Belgian Beer Café in 2005, called The Ponsonby. Especially impressive on a sky blue canvas. Edit 16/03/2013: This building is being marketed for sale. The New Zealand Herald has an interesting writeup about its history, including a murder story, no less. 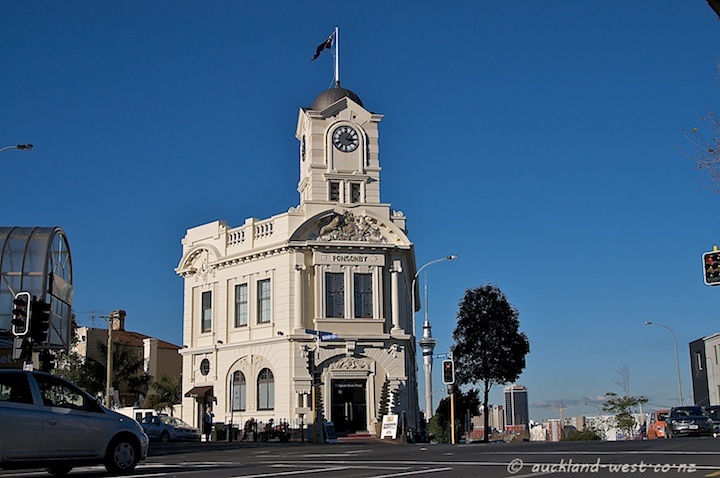 The Old Ponsonby Post Office certainly dominates the landscape there. It’s a beauty and I’m glad it has been restored. Great shot!Have a nice weekend!